It’s strange to me that in a few days April 2018 will have come and gone and we’ll be moving towards summer here in Seattle. Time—as ever—ticks forward. I realize that for the last few months, April in particular, things have been rather quiet around here. Damn near ghostly, in fact; so I wanted to take a moment to update everyone on what’s been happening. I’m still hard at work on rewrites and edits for Coal Belly. That seems to be my usual state of being lately. Edits tend to be difficult for me, namely because my eyes see what my brain wanted and not what should be there. Thank goodness for copy editors. That said, it’s coming along at quite a clip, and I’ll be reaching out to my beta readers this summer. Then, once I get their feedback, I go back through it all over again. The fourth Bell Forging Cycle novel has been in the works for some time now. While there hasn’t been any prose written, I do have a rough outline, and think I know where I want it to go. Now, whether Wal behaves is another matter. So often we writers create characters and then the characters do something wildly different than what we planned. It’ll be interesting going back to it after having written two very different books in the interim. So that’s been my spring. It’s odd writing posts like these, because while a lot has been happening, it doesn’t always come across that way when you lay everything out. Once that progress slider is full it seems like everything should be done, but in truth, the first draft is only the beginning. Those who have spent any time in an American History class is aware of the famous Battle of Hampton Roads. It’s the infamous naval conflict between the Merrimack (captured and renamed the CSS Virginia) and the USS Monitor, two of the world’s first ironclads gunboats, which duked it out to a draw in the waters of Chesapeake Bay. While these two vessels have become legendary, they weren’t alone; many more gunboats were fighting on the rivers during the American Civil War. Technology had begun to modernize, and the gunboats of the Union Navy and Confederate fleets were no different. The war revealed a point of transition in the evolution of sail to steam as watercraft shifted from the traditional frigate-style sailing vessel towards the warships we see today. Turrets were introduced, armor became commonplace, and propulsion was beginning to change from paddle-wheels to the screws. The era of wooden ships of the line died in 1862 as the ironclads rose to prominence. My current project, Coal Belly, is a weird west fantasy set on a planet crisscrossed by interlocking rivers. It’s a rough-and-tumble world where riverboats are omnipresent and necessary for everyday life and used in war. In the book, the empires of Artada, Othwell, and Cyr patrol their territory with a variety of gunboats, and I wanted a spark of authenticity. With that in mind, I felt it necessary for to research the naval fleets of 19th Century, with the Mississippi and its tributaries playing such a vital part in the American Civil War, it was the perfect place to start. The Union dominated naval warfare from the outset. Where the Confederate forces saw some early advances with the capture of the Merrimack and its retrofitting, it didn’t take long for the Union to catch up and overwhelm the Rebels. Gunboats came in many varieties and could be broken down into four main categories: Rams, Timberclads, Tinclads, and of course the emerging Ironclads. There was a fifth category as well, used primarily by the Confederates, which is commonly called the Cottonclads. Let’s look into each of them. These were the creation of Colonel Charles Ellet Jr., a Navy man who was convinced that the ancient ram technology could be adapted to modern usage. Under his guidance, he built out the United States Ram Fleet. The rams tended to be sidewheelers and were usually faster than their civilian counterparts, and unlike other navy boats they carried few guns; instead, they used reinforced timber bows to smash into opposing boats. Only four timberclads were used during the war, the USS Tyler, USS Conestoga, USS Lexington, and the USS Avenger. While these were modeled after standard sidewheel riverboats, these vessel’s crew were protected from small-arms fire by 5-inch thick oaken bulkheads. To me, they’ve always looked like a floating windowless factory. The most common gunboat of the Union Navy’s river fleet were the tinclads. These were usually sternwheelers with metal sheeting tacked to the side to protect the crews. Keep in mind that this thin sheeting wasn’t useful while under fire by heavy artillery. It was chosen to protect against small arms. Where civilian packets tend to feature open decks and promenades, most tinclads have a boxed-in look. Each of these boats was assigned a number which was painted on their pilothouse. The first iron vessels were designed to be ocean-going and operated mostly along the coast. The French Glorie was the first, but more followed her. On the rivers and during the American Civil War, Ironclads came in many varieties—two were most common. The first was the turreted Monitors named after the famous warship the USS Monitor designed by John Ericsson. The second type was the casemate-style gunboats with sloping sides, not unlike the USS Merrimack. These were more commonly found on the rivers. At the beginning of the war, the Union converted civilian packets, but later they developed the City-class ironclad; these 13-cannon gunboats ruled the river. After their introduction, they were present at every major conflict along the Mississippi. 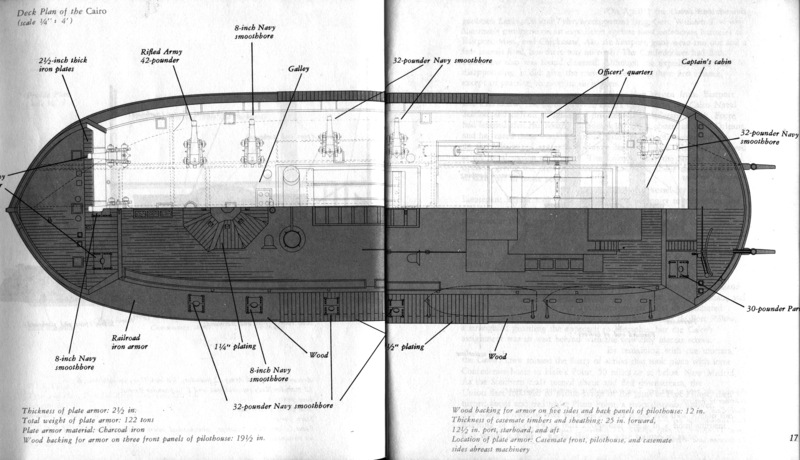 Interestingly, many of these City-class ironclads were centerwheelers with their paddle wheels located at the aft-end of the center keel and protected by bulkheads and armor plating. A creation of the Confederate fleets, the cottonclads looked much like their counterpart riverboats. However, as an added form of protection, their hollow bulkheads were filled with packed cotton. Cotton bales were also set up around guns and pilothouses as additional forms of protection. You could write entire books on gunboat strategy in the American Civil War which isn’t the goal of these posts. However, if you’re interested in learning more, I’d recommend starting with Sam Smith’s article, The River War. But for this post, let’s take a gander at some images I’ve gathered as a part of my research over the last few years. These will provide visual examples of the five categories of naval gunboats and give a glimpse of the life of a brown water riverman; check them out below. 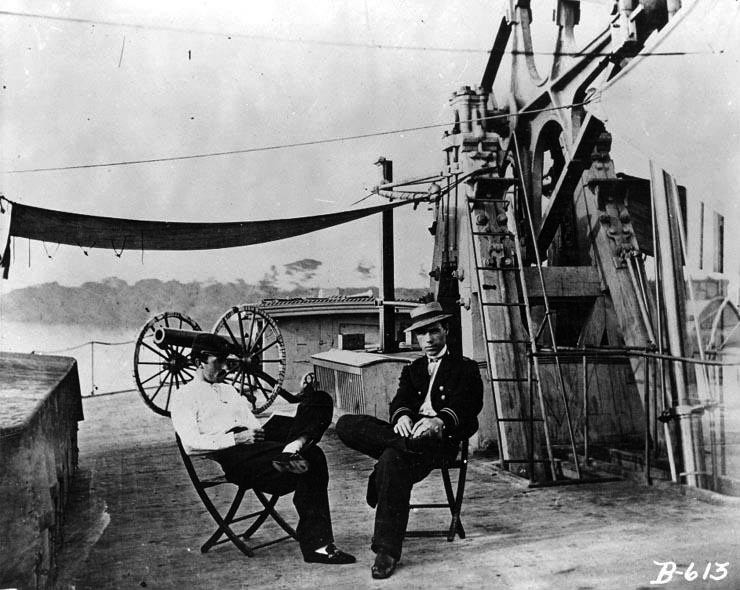 Seated officers on the USS Hunchback, a converted side-wheel civilian ferry. The monitors USS Chimo and USS Tonawanda [Foreground] and the ex-CSS Stonewall [Background] moored off the Washington Navy Yard, Washington, D.C. Controlling the Mississippi River and its tributaries was a vital part of the war effort. I can see why so much innovation happened in such a short amount of time. Technology provided an advantage, and in the narrow confines of a river, that advantage is beneficial for a brown water navy. With the tale crossing empires, expect to read about plenty of gunboats within the pages of Coal Belly. The pictures above have been collected over the last five years, so I am unsure from where they all come (usually the Library of Congress.) But, they’re all old enough to be in the public domain. As before, in some cases, I did some minor color correction and cropping. I’m happy to answer any questions folks have about any of these images or riverboats in general. (Sometimes it gives me a good excuse to research something.) You can send me an email or leave a comment below. I love comments. This is the latest in my series of posts sharing my findings from my research for Coal Belly. You can check out the other riverboat-related posts in the links below. This blog is a story in itself. It’s the documentation of a journey. Growing up, I remember my grandmother talking about becoming a novelist. She often spoke of the stories she wanted to share, the memoirs of her life, but she never finished her book. I believe the world is a little less without her words. From the beginning, the intent of I Make Stories was to chronicle my process of becoming a novelist—the good and the bad. As I have shared my experiences, I often wonder: what would have happened if my grandmother had read this blog as a fellow writer? Would she have been dissuaded or encouraged? On that note, it’s time for a bit of reflection, and hopefully a bit of encouragement. It’s become a tradition around here that every two hundred posts I pause and take a moment and look back at what has happened in the time between. In 2014 I wrote my two-hundredth post, in 2015 I hit number four hundred, and here I am in 2017 looking at number six hundred. It’s been a long trail. Things haven’t always been easy, but generally, nothing worth doing is easy. Days of discouragement are as common as the days of victory. Even as I write this post, I’ve been struggling through some serious self-doubt. I’ve come to expect it now, it’s a part of creation. Random events interrupt and derail process and progress. Writing takes time and effort, and it can often be a lonely endeavor. It requires a commitment to yourself and often that is more difficult than we realize. But even with the trials of creative work, things haven’t slowed during the last two hundred posts. Each obstacle has been surmounted and I’ve found successes along the way. I’ve sold a lot more books, many thousands now in total. I’ve hit the Amazon best-seller page multiple times. My presence at conventions has also expanded, and I’ve met some incredible people and new friends along the way. On the story front, I launched Red Litten World which fans have enjoyed. I’ve finished the first draft of a standalone non-traditional fantasy (the title which I am keeping secret), and I’m nearly done with the first draft of Coal Belly my enormous steampunky riverboat adventure. Then it’s on to book four of the Bell Forging Cycle. I’d like to think the content on this blog has gotten better as well. I’ve begun to share some of my discoveries in my research and delve into more details in the world of the Territories. There’s also this little thing which fans of the Bell Forging Cycle have yet to unravel. Plus, I have some other exciting plans for the future. I couldn’t have done this alone. Although she never knew me as a writer, there is something of my grandmother in everything I write and for that I thank her. She might not have told her stories, but she empowered me to tell mine. And of course, there is you; my readers. I couldn’t be here, looking back from post six hundred, without you. Thanks for the passion. Thank you for buying my books. Thanks for reading them, and leaving reviews. Thank you for telling your friends and helping to spread the word. Thank you for the emails and the encouragement. There’s a lot of books out there to read, and I’m so grateful you picked mine. As before, I won’t dwell here long. Stick with your work fellow creators. Milestones are meant to be passed. Number eight hundred lies somewhere in the distance and who knows what we’ll see in the spaces between.